Yesterday was my big girl's 7th Birthday, so of course we had a chintzy tea party to celebrate. Now my eclectic child "gets" my vintage love, she was so proud of it all - but I think the other children were really struggling with the time warp they walked into .... Oh it was so cute. Individual place settings with a handmade crepe flower each, charity shop glasses (perfect size for the girls), pink lemonade, sweet treats, doilies and anything else that made my heart skip a beat on the day. One of the biggest successes was with a recipe called "Pink Passion Lemonade" that I found here (courtesy of Pinterest). It's essentially not lemonade at all, but lemon juice with a few other things. My big girl loved it!! The girls also loved these dipped marshmellows - no recipe required, but they did look fabulous on the lollipop sticks I found at Spotlight. Honey rice bubble slice also went down well with the girls - lucky we have plenty left over as it's a treat we enjoy. Now the crepe flowers were fun to make, I followed a few tutorials that I found on the internet but none of them worked well for me so here is my own mini tutorial. Cut 2 widths (about 5cm - make sure both are the same width and about 1 metre (or just over 2 feet) in length) and place one on top of another. Sew close to the edge with the longest stitch possible, and the loosest tension possible. The crepe with sort of gathers as you go. Roll into a flower shape that you like, mine were fairly loose (tight rolling just didn't work out right) and glue with a glue gun as you go. Especially cute with contrasting crepe. You could make big or small - it wouldn't really matter. Oh so gorgeous. My daughter was fascinated with them - even gave me a great big cuddle to say thank you for making all the beautiful flowers. The birthday was simple, yet fun. So much Chocolate!!! And the birthday girl herself, can't believe what a wee lady she is turning into. Oh my goodness! What a beautifully memorable day for your very blessed daughter! So many creative ideas! 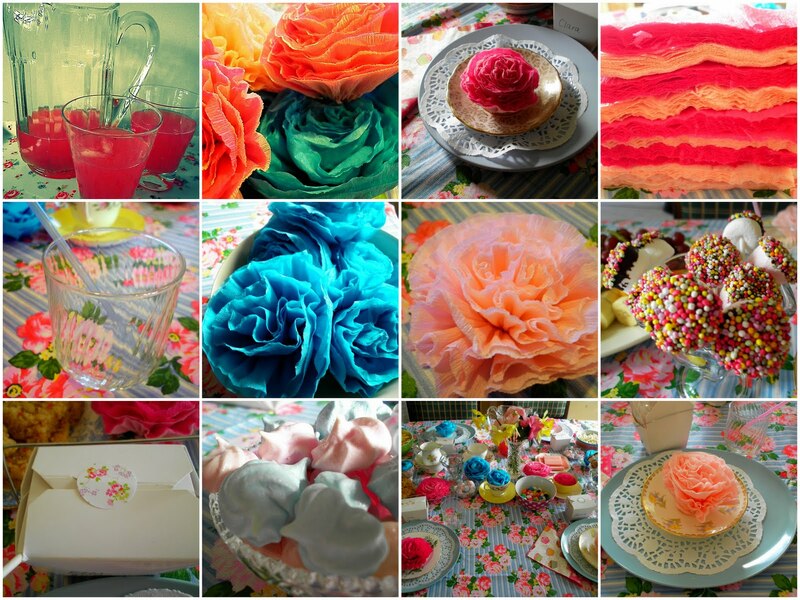 Love how the crepe paper flowers even looked like crisp peaks of a thickly frosted cupcake. And the chocolate decoration...oooh lovely! Love those flowers- thanks for the tutorial- will be bookmarking for the future. Oh hon, what a stunning party! You've put so much effort into everything - I wish I could have been there to see it all!! I can't wait to make some of the flowers - they are amazing. I love your photos too - they look fabulous.